The OSCE monitoring mission in eastern Ukraine has finally arrived in the town of Debaltsevo, after a local militia provided guarantees of security. At the same time Kiev and rebels in Lugansk gave independent reports of prisoner swaps. Representatives of the OSCE special monitoring mission (SMM) in eastern Ukraine arrived at the town of Debaltsevo in the Donetsk region, the mission's spokesperson Michael Bociurkiw announced on Saturday. Access to the area, which had reportedly been a sticking point at the Minsk peace talks, and which continued to be a scene of fighting between the anti-government forces and Kiev troops, was possible with the militia's guarantees of security, Bociurkiw told Ukraine's 112 tv channel. The observers arrived at Debaltsevo along with the International Committee of the Red Cross and several trucks, bringing food and medical supplies to the region, the OSCE spokesperson said, adding that its observers are working on a full report on the situation in the region. He also called for all sides to observe the cease fire agreement in all territories in eastern Ukraine and provide access for the mission to all its regions. 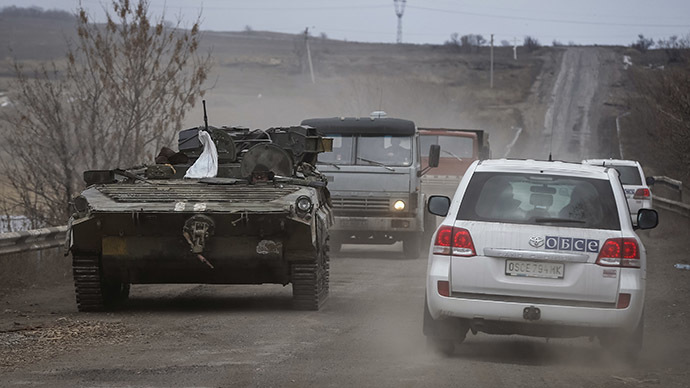 Kiev forces allegedly obstructed the OSCE mission's freedom of movement, after keeping the observers at one of the check points some 80 kilometers from Donetsk, RIA Novosti reported. Citing the mission's representatives, it was said that while at one of the check points the observers had to wait for a while to be let through, at the other security point they were denied entry by Ukrainian servicemen, due to lack of travel documents. On Saturday, the OSCE SMM in Ukraine also asked both sides of the conflict to provide details of their heavy weapons in order to verify their withdrawal from the area. In its statement, the SMM asked for details of "inventories of their heavy weapons; the routes along which they intend to withdraw them; or where they will be concentrated." Post by OSCE SMMU - Special Monitoring Mission to Ukraine. In line with the truce, which was agreed by several world leaders in Minsk last week, the self-proclaimed republics in Ukraine and military officials from Kiev conducted a prisoner of war exchange on Saturday. At least 35 prisoners from each side of the conflict were freed on neutral territory near Lugansk, the self-proclaimed Donetsk people's republic spokesperson told Ria Novosti. The Lugansk militia also reportedly planned to conduct an exchange with the government. Ukraine's President Petro Poroshenko announced the release of over a hundred of Ukrainian soldiers on his Twitter. 139 Ukrainian soldiers have been released from captivity. Humanitarian aid from Russia was also delivered to the town of Debaltsevo on Saturday, Interfax reported, citing Russia's Foreign Ministry official. Supplies of food, medicine and everyday necessities were delivered to the region with the help of Russia's emergency services.